The blur gods make this one rather annoying. From the Bushiroad Championship 2017 in Indonesia. 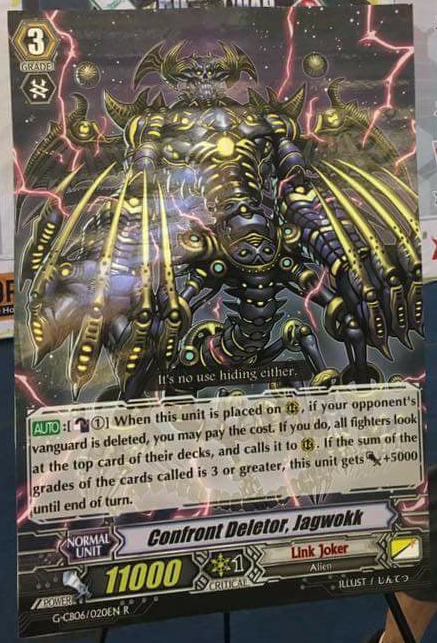 AUTO: [Counter Blast 1] When this Unit is placed on (RC), if your opponent’s Vanguard is deleted, you may pay the cost. If you do, all fighter’s look at the top card of their decks, and calls it to (RC). If the sum of the grades of the cards called is 3 or greater, this card gets Power+5000 until end of turn.